RightStart Mathematics Second Edition - RightStart™ Mathematics by Activities for Learning, Inc.
RightStart™ Mathematics Second Edition is here! We are just waiting to share our award-winning and innovative approach to teaching mathematics with you and your children. The redesigned lessons and worksheets include an easier-to-teach format, incorporates updated research, and continues to advance and develop the child’s conceptual understanding of critical math concepts with the philosophy and approach for which we are recognized. RightStart™ Mathematics Level A, 2nd Edition – AVAILABLE NOW! RightStart™ Mathematics Level B, 2nd Edition – AVAILABLE NOW! RightStart™ Mathematics Level C, 2nd Edition – AVAILABLE NOW! RightStart™ Mathematics Level D, 2nd Edition – AVAILABLE NOW! RightStart™ Mathematics Level E, 2nd Edition – AVAILABLE NOW! RightStart™ Mathematics Level F, 2nd Edition – AVAILABLE NOW! RightStart™ Mathematics Level G, 2nd Edition – AVAILABLE NOW! RightStart™ Mathematics Level H, 2nd Edition – Coming Summer 2019! What does the RS2 lesson format look like? Every lesson is set up with the easier-to-teach format. The heading identifies the Objectives and Materials needed for the day. The Activities for Teaching in the left columns details how to proceed with the lesson. Explanations in the right column provide additional information relating to the lesson, research, or hints on helping the child. Because RightStart™ focuses on developing the child’s conceptual understanding of critical math concepts, topics are approached in a variety of ways. This requires a number of specific materials. The RS2 Math Set is a kit that will be used for all the RS2 Levels. It is a one-time investment and used for Level A through Level F.
The lesson and worksheets for each level are available in Book Bundles. Worksheets have a copyright for a single child’s use, so additional worksheets are needed for multiple children. Electronic worksheets, with a copyright for a single family’s use, are also available. Do we have to start with RS2 Level A? No. You can begin at the child’s appropriate level. Take the Placement Test; this will identify the entry level. All levels, other than Level A, have review lessons in the beginning few lessons. 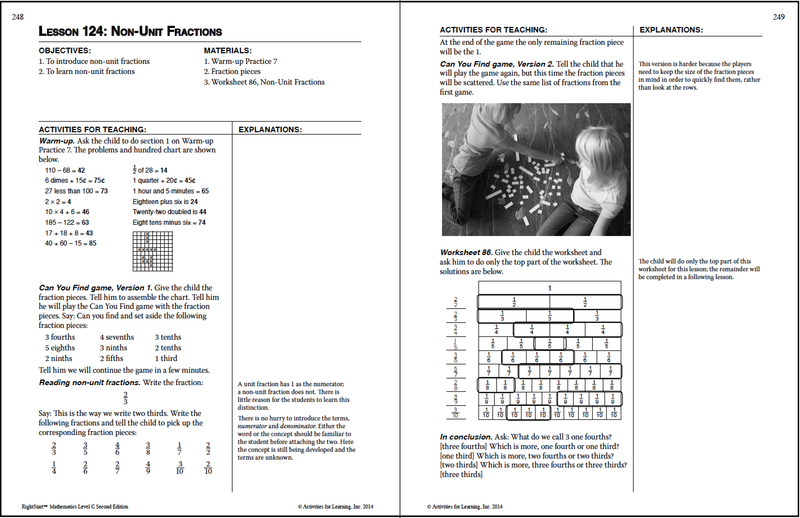 These lessons summarize the prior level and introduce (or reintroduce) the AL Abacus and RightStart™ philosophy and approach. Can we switch from RS1 to RS2? If you are currently using the first edition and want to change to the second edition, we have Bridge Kits to “bridge” the difference between your current materials and the RS2 Math Set. Get the appropriate Bridge Kit, add in your Book Bundle, and you’re ready to go!